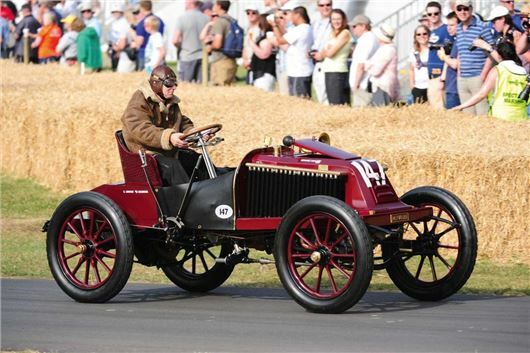 Renault will celebrate “over 115 years of motorsport innovation on success” with a Goodwood FoS display spanning from a 1902 model to the company’s latest hot hatch. The 1902 Type K race car, above, will spearhead the display as the earliest model, but frankly the most exciting model is the pristine Renault 5 Maxi Turbo set for the show, below. The most modern production car in the lineup is the Renaultsport 220 Trophy EDC, a UK debut of the latest production version of Renault’s hot hatch, and the car tasked with rectifying the mild disappointment that is the current Renaultsport Clio. Mild disappointment is not something one is likely to feel when approaching the Renaultrpot R.S.01, also on display, which Renault says is a “design leading Renault’s future direction.” So you can expect the next Twingo to look like it, obviously. Currently racing in the World Series Renultsport Trophy Championship, it’s mostly made of carbon, has a 150-litre fuel tank and an engine developing more than 500PS. Back to the past, Renault will take a varied array of old racing cars up the hill climb, including the Type K, a 1975 Renault 17 Group 5, three F1 cars stretching from 1979 to 2005, and the 1926 Renault 40 CV, below. A car that was Renault’s range-topper throughout the 1920s, this 1926 version packs a 9.0-litre engine developed specifically for speed trials, a single seat cabin and true endurance credentials: it managed 50 miles at 118mph in 1926, and a 24-hour average speed of over 108mph, which at the time was, you can imagine, incredible.